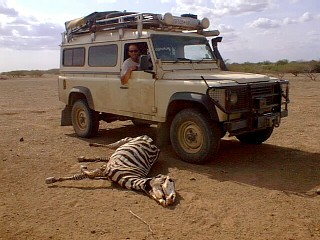 Travelling in north west Kenya is a real treat. 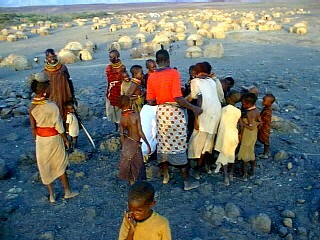 The landscape is vast and barren but you are warmly welcomed by the Samburu tribe. This is little - visited land which makes it all the more special. 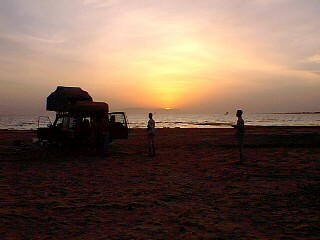 Lake Turkana is an unexpected waterhole in the middle of a desert. 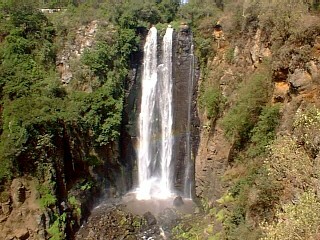 It is a long route from Nairobi but worth the effort. The border formalities were quick and we kept the immigration chap busy so he didn't notice that we had already been into Kenya. Visitors are allowed to stay free for a month but then have to pay $50 for another month. We were hoping that our second visit would not require a visa. Either he didn't notice or wasn't bothered. We were told the road to Nairobi wasn't good and were prepared for potholes galore and heavy bus and lorry traffic. At one point a local (called Gordon) crashed his bicycle into us. We had slowed down behind a lorry on a potholed road. Sadly the local did not have enough braking ability to slow down. He had no front brakes and only one rear pad made slight contact with his back wheel rim. He rode out into the middle of the road to avoid the roadside vegetation but his left arm hit our mirror and forced him to turn towards the car and crash into the wing before doing a very stylish somersault into the middle of the road. He was all right but his bike wasn't. The front wheel came off and was seriously bent and the seat was hanging off. It wasn't long before a crowd gathered and this local was talking about getting treatment for his injured shoulder at the local private hospital. I wasn't surprised when we were asked to pay for it. Fat chance! He wanted us to give him the money and his friends to take him down there. We are not that gullible. After a bit of chat we agreed to drive him and his bike home. At the drop-off point he didn't seem to have any problem shaking hands with his friends using his injured arm. Again demands for money were made (this time to fix his bike) at which point we made it quite clear that it was his fault and then left. Now we have a scratch on the wing to remember the incident. Later that day when we had almost reached Kericho it was dark and raining. There are no street lights here and the number of vehicles driving without lights was amazing. We were desperate to get off this road - the same one as the two fatal bus crashes in recent months where 200 people died. We were overtaking a lorry when it decided to pull out. There were two choices. One was to crash into the side of it, the other to dive off the road. We took the latter not knowing what would happen as we dropped off the tarmac and onto the dirt and grass. Everything was in slow motion as we anticipated the impending slide and roll into the field. But no, Punda held on and after a very hair-raising 100 m or so we were back on the road. Thankfully Kericho was only a few miles away and we were able to calm the nerves with a few beers in front of the fire at the Fish Resort. We were not sorry to see the end to that day. In the morning Gordon left early to go to Nairobi. Andrew and I stayed behind as we wanted to visit a tea plantation. 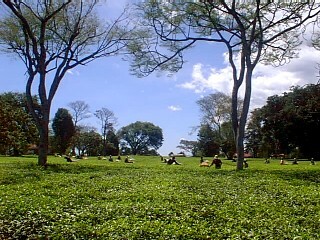 The landscape and climate around Kericho is superb for tea growing and everywhere you look there are plantations galore. At The Tea Hotel we were told that they had their own plantation which we could be shown around. Our guide, Peter took us on a very interesting tour of the plantation. Fortunately the pickers were there and we could watch them pick the necessary two leaves and a bud and place them in the bag. The speed at which these pickers work is incredible. Most of the plantations in the area are owned by Brooke Bond and 200 or so pickers are employed by the company. Depending upon the type of plant the new growth is picked every 8 to 14 days so the pickers rotate between fields on a regular basis. Wages are determined by the quantity of leaves picked. 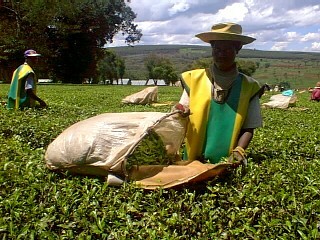 Each kilogram fetches 3.64Ksh and after a nine hour shift a picker can expect to earn around 300Ksh (£3). They consider this to be a good wage and can live adequately on it. Picking tea must be one of the most boring jobs on earth and the pickers are out in all weathers but they seem quite happy. This is a desirable job in Kenya. As the workers are brought in from various parts of the country they are provided with a home, schooling for their children and health care. A group of American tourists had arrived at the hotel and had booked a tour of one of the local factories. It is necessary to book factory tours in advance and we were delighted when Peter asked us if we would like to follow along. Great, this was a real treat. At one of the huge Brooke Bond plantations we were taken on a tour of the fields, saw some more picking and then went to the factory. First the tea is tested for quality. There must be 120 of the desired stem and leaf types in a 1kg random sample for the batch to be acceptable. Once it is accepted the batch is weighed and the leaves laid out for withering. 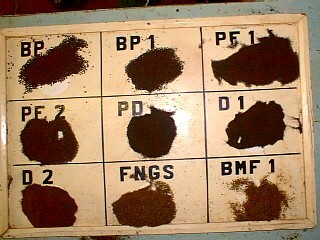 This process involves blowing and sucking air over the leaves for 18 hours, the first two hours removes any dirt. Once withered the leaves are chopped up and placed in bins to have cold then hot air blown through. This process of fermentation takes around two hours and partially dries the leaves. Afterwards the fermented leaves are blown about in high temperature furnaces for 21 minutes before being smoked. The tea is then graded into high quality tea (large pieces like sugar grains), tea of various quality (depending upon particle size), then bits of stalk. It is then bagged. Picking to packing in less than two days! Retailers select which teas they want to sell to the public and the prices are determined by the proportions of different quality teas they put in their packets or teabags. 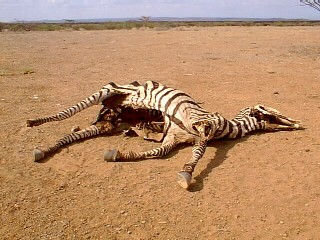 The whole tour was fascinating and by the time we had finished it was too late to head towards Nairobi. Peter asked us to join him and his girlfriend Nora for dinner. The Tea Hotel is a lovely place. It is in need of a little updating and marketing (Peters job) but the setting and atmosphere is superb. We set up camp in the gardens and had a lovely view over the plantation. 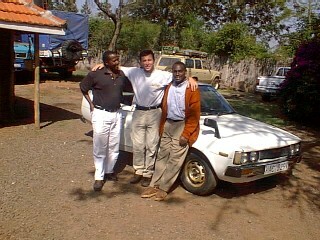 At Peters home we were made most welcome and ate a local dish of meat with ugali. He has only recently joined the hotel and is looking for ways to improve it so we gave him a few tips based on our short experience. Wednesday 17th was Gordons birthday and we were up at 5.30am wrapping his pressie and icing his cake before dashing over to Nairobi to meet him before he went out. The journey was lovely through the rift valley and past Lake Nakuru coloured pink by the thousands of flamingos on it. We were a little late reaching Upper Hill Campsite as Gordie had already left so we got on with a few jobs before having birthday celebrations in the evening. Gordon surprised us with "Comet Tour of Africa" t-shirts which he had made up in Kabale. After cheese and wine we all went out to a local pub to watch a football final and of course we were all sporting our t-shirts. The next night we visited the cinema to see 'American Beauty'. 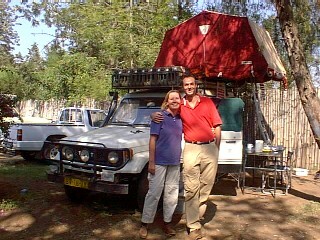 The following day was spent mostly at a Landy garage - Land Marque Ltd owned by a white-Kenyan named Peter, and Lucy. He is just setting up the business and it looks to be excellent. The cars went through an underneath health check. All four of Comets shock absorbers have failed after five months. Given that these were Old Man Emu shocks it is pretty shocking as they cost a fortune and are meant to last forever. Next day was more chores and half way through the washing the water ran out. Well, this is Africa! That night we were invited out by our Swiss friends, Peter and Patricia to visit the Carnivore restaurant - infamous in Nairobi. The three course menu is set and the middle course consists of as much meat as you can eat. Entering the restaurant is like entering a game park but then you see the biggest bbq you can imagine. Talk about a feast. As well as the usual types of meat you get a selection of game meat. Ostrich was nice, crocodile was tough, fishy, boney and disgusting - what more can be expected from such an ugly creature. 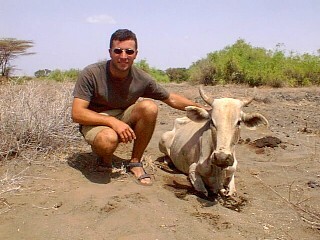 Eland was a bit tough and the zebra was just lovely. It's so strange getting excited about these animals in game parks and then eating the things! After such a feed I can say that the tastiest meat was beef! The weekend was spent doing work on the Landys and enjoying ourselves with Paul and Lucy at their home. 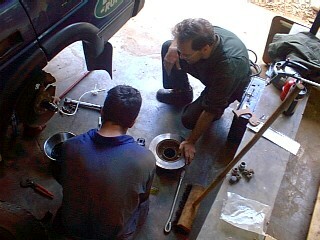 Gordon did some major work replacing shock absorbers, etc. while we replaced a worn ball joint which removed all signs of the clonk we had become used to over the last few weeks. Sunday 21st was Pundas 7th birthday and we celebrated by going out to see the very disturbing film "8mm" with our friends Tipsy and Raju. 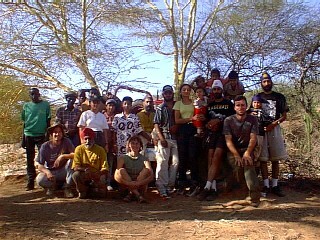 We were a little reluctant to leave Punda in town while we watched the film as Nairobi's crime reputation is not good. However a security guard said he would watch it for us for which we paid a quid - almost a days wages for him. It's a sad state of affairs when you have to hire someone to guard an inanimate object. Returning to Karen after the film we were amazed at the number of cars swerving all over the road. We followed one car who spent most of the time in the other lane forcing approaching cars to dive off the road to avoid him. We just watched in a state of disbelief. Then he hit one car. The car behind that pulled out to avoid the collision and almost hit us. The loony driver carried on - no stopping at the scene of an incident in this country. We got his registration number and returned to the car that had been hit. Well, that car looked as if another dent didn't make any difference and the two occupants could hardly stand up as they too were so drunk. We were glad to get off the road that night. The following week was spent at Tipsy and Raju's garage doing some work to the car. Many travellers have reported having problems with their roofs following their journey from the north. The roads apparently are so bad and the weight of the roofrack gives the joints holding the roof up a hard time. We decided to strengthen our pillars by welding on some supporting plates. The only problem is that you have to remove the roof lining, the dash board and the windscreen to do a professional job of the welding. Our anticipated two day job turned out to be seven as intricate work followed thorough preparation. 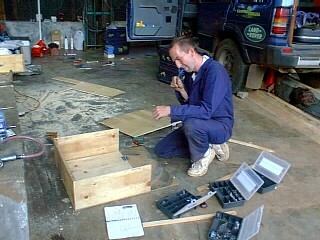 The chap doing the welding, Nashton, did an excellent job and we were pleased to have done the work. We were able to park the car in an undercover area of the workshop and were left to get on with the work and call in Nashton for the welding. It was good to have an opportunity to do other maintenance chores such as put another three coats of varnish on the wooden table and to fit some big mudflaps. Gordon spent the week re-replacing his shock-absorbers as his new ones didn't fit sufficiently with his spring arrangement. When you put heavy duty springs on a car you cannot fit ordinary shocks and he ended up buying some shocks for a Toyota and welding new eye pieces on. It's common to do so in Africa. Upper Hill Campsite provided us with a room for the duration and our evenings were spent either tapping on the laptop or going out with the locals. Raju invited us to his home for dinner and we had another lovely evening with his family. They are such lovely people and have agreed to let us cook for them next week. One evening was spent at the cinema with Christine and Thomas from Switzerland and another evening with John the taxi driver and Gordon. John took us to a bar/restaurant/night-club popular with the locals. We were the only three muzungos there and it felt a little odd. The food was a local dish - one big tilapia with ugali which you just tucked into using your fingers. The meat dish followed in the same format only this time eaten with chilli sauce. The beers kept flowing and we spent a couple of hours on the dance floor bopping away to local tunes, not understanding a word of the kikuyu or kiswahili words that were being sung. The locals were so welcoming - they liked dancing with the white guys! Later in the week at the campsite we met Eric and Miriam from Holland who said they had read our website while they were preparing for their trip. Hooray, we're famous. We were as delighted to meet our site readers as they were to meet the authors. We met Dennis and Aaron at the campsite too who's "ed-venture" through Africa is for the purpose of producing material for use in schools. They too are going north and were facing the same problems as us with the Sudan visa. The tensions around Nairobi escalated over the week. Students rioted and burned out four matatus in retaliation to a matatu driver's treatment of a student. It was announced that electricity will be rationed from next week with industrial and residential areas each having twelve hours worth of power per day. The water situation is getting worse...etc. There was no news from the Sudanese Embassy about our visas but we heard on the grapevine that land visas were not being issued. We withdrew our passports and put in for the Ethiopian visa at $63 each. Ugh - that was a drag as EVERY report about Ethiopia has said that the countryside is lovely but the people are just the worst. Apparently the only local lingo we need to know is "go away" and a less polite version of the same words. We'll try to get a Sudanese visa from Addis Ababa instead. Going north is certainly fraught with problems particularly as the political situation changes on a daily basis. At the end of the week we heard that the war between Ethiopia and Eritrea is over - perhaps the international sanctions have worked! By the end of the week we were itching to get a move on. We knew we had been in Nairobi for a long time when the cleaning lady at the campsite casually said to me "where's Punda today"! The evening of the 29th was to be our night of cooking for Tipsy and Raju's family. 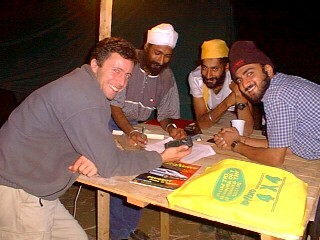 Preparing a traditional English meal for a Sikh family who eat no meat or eggs was quite a challenge. However our selection appeared to be enjoyed but a four course was rather too much for us all and we struggled with the cheese and biscuits. Work on the car was completed the next day and all was going well until the windscreen went back in. "Crack!" Not again! Now we had a mended crack and a really big extra one. 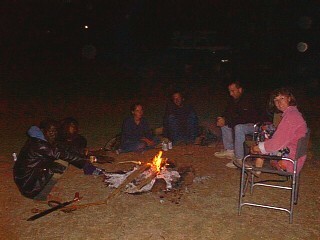 It was great to be back in Punda at the campsite that night - it was like going home again. 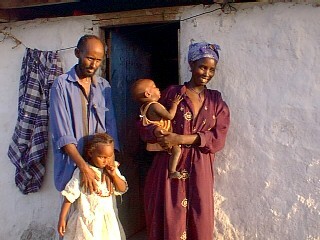 By Wednesday 31st we had given up hope completely on the Sudanese visas. At the customs department we got our carnets stamped for the 10th as we had decided to exit Kenya through an unofficial border by Lake Turkana to avoid the terrible road conditions, the military convoy and the bandits on the usual Moyale route to Ethiopia. After spending three hours getting a new windscreen and a similar time stocking up on food at the supermarket we were back on the road. 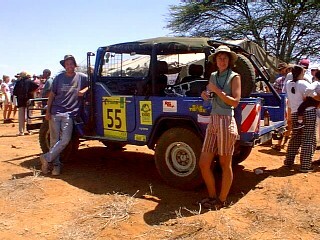 We had been invited by Tipsys family to one of Kenyas annual events - the "Rhino Charge". First we had to make our way towards the designated competition site and spend the night in the carpark of the Sikh temple! Tipsys family had entered two teams. The aim of the event is to raise money to build a fence to protect rhinos in Kenya. The 7000Ksh (£700) entrance fee is prohibitively expensive for most but around fifty teams entered and the task was to drive through the bush between twelve control posts in the shortest time and the shortest distance. Ten and a half hours were given to complete the task and the shortest circuit possible was approximately 45km. 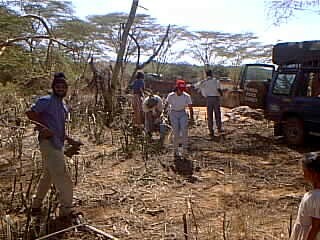 However the area consisting of Masai bushland with its riverbeds, boulders, inclines, thorny bushes and very few tracks made this very challenging terrain indeed. GPS co-ordinates of the control points were given and it is up to teams to determine where they go. The variety of cars was amazing - high clearance, very basic lightweight vehicles with 16ply tyres. The capability of the cars was truly amazing too going over things that you would never even attempt in Punda. There were six people per team, one driver, one navigator and four scouts who have to run around in the bush trying to find a suitable way through. Only seven teams completed the task. Andrew and Gordons teams each reached seven control points. Andrew was extremely disappointed as the official terratrip which measured the distance travelled broke after a few points so they were automatically out of the competition. Both chaps were absolutely shattered when they returned and were cut to bits from driving through dense thorny bush land. It was interesting spending time with a Sikh family where the roles of the males and females are strictly defined. The women sit down while the men unpack lorries and pitch tents. The women look after the children and do the cooking. After three hours of sitting I'd had enough and got the machete out to do a bit of land clearance! The prize presentation ceremony was good fun, primarily because there was free 'Bucks Fizz'. Rude not to participate. I went to the booze tent for an nth top up and was told "sorry, no more orange juice". Dash - I'll have to make do with just the champagne then! Late afternoon we left to make progress towards the north of Kenya. There were only two hours of light left and just enough time to make it to Thompsons Falls. We were only a few hours north of Nairobi and the landscape had turned distinctly 'wild west'. It was barren and vast with the occasional pig ranch. With Dixy Chicks on the stereo all was quite appropriate. By the time we reached the T-Falls Hotel there was a power cut so we had a very average dinner by candle light. This is the highest town in Kenya and the night was really cold and after a very average breakfast we had a quick peep at the falls before continuing towards Maralal. The Yare Campsite was quite pleasant and we had our first campfire in ages. What a treat. In the morning we splashed out on Samburu spears - six of them. The Samburu tribe are amazing. They are very similar to the Masai in how they dress in red and adorned with beads galore. However their traditions are quite different. Maralal town is very interesting with colourful markets. The locals are a bit of a nuisance though - coming up to you with their alcohol breath saying they have no money to feed the family. There's a surprise! Maralal is the last place to stock up on properly priced diesel. The road to South Horr past the Ndoto Mountains was beautiful. 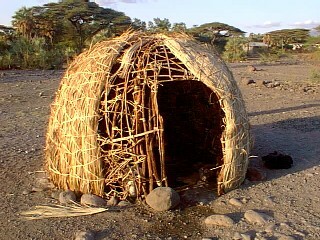 This part of Kenya is very much like Namibia with its volcanic history and landscape. 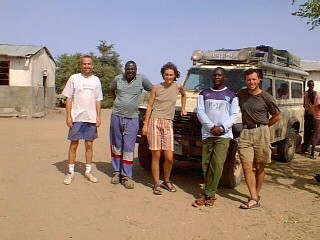 The road became quite rocky and public transport (in Land Rover matatus) came to an end at this point. Gordon had given a lift to a local Samburu woman who regularly spat out of the window. This seems to be the way here. We spent the night at the local community camp - Kurungu Camp where you wash in the river and immediately get inundated with locals selling their wares from the moment you arrive. It is really nice to see the tribes in all their regalia which they probably put on specially for you. Some of the facial adornments are wonderful. As soon as you poke your head out of the car their face is in yours saying "photo". Then they crowd around you and don't go away. In the morning it was worse because the tour truck had left and we were the only wallets around. It is so sad because posing for photos is one of the very few ways of making money and they try to crowd you out because they are desperate. It is this crowding that makes you want to leave. These people have very little food and it was difficult to eat breakfast in front of them. One of our loaves had gone stale but they ate it and there was a fight over who got my rubbish bag. They eagerly look through the rubbish for leftovers, things they can recycle or things they can sell. Andrew bought a beautiful spear which we were told was original and had killed ten animals. After another day on the road through the barren landscape of the Chalbi Desert and its oases (just like Morocco) we reached Lake Turkana. What a fantastic sight. It was like a mirage - a turquoise splat across the sandy background and the islands on it looked as if they were floating. Visions of the Red Sea in Sinai returned. Driving along the lakeside over the next hour towards Loiyangalani was surreal. On one side was desert, on the other a lake. There was very little activity and only two dhows sailed along. At the Safari Camp the locals poked their heads through the fence to sell their goods. Andrew bought another spear! The Catholic Mission has diesel for sale by the jerry can but it is expensive at 60Ksh per litre as opposed to the usual 40Ksh. The following morning we took a brief dip in the lake before driving on to the headquarters of the Sibiloi National Park. People had told us that the road was rough and hard going. Apart from being slow going in parts it was quite fun and the scenery quite beautiful. Unfortunately the road out of Kenya through this unofficial border means that you have to pass through the park and pay an entrance fee of $15 per person and $2 per person to camp. There is very little animal life in the park except for the occasional fox, gerenuk (antelope with a very long neck) and cow. We did spy a group of beisa which are related to the gemsbok of southern Africa. Soon we were camped up by the lake next to the flamingos and crocodiles and discovered that the reports of it being very windy by the lake at night are true. The wind howled and banged on the tent all night and in the morning it was too windy to eat as our cereal would have blown into the lake. The warden at the park headquarters deserves to get the sack. We visited the office to get some details on the park. They have no maps for sale, no map on the wall or indeed any form of assistance to navigate your way around. We asked for information on the sights in the park that we may be passing but the warden accused us of not doing our homework and didn't have any information to offer. We had to exit quickly before giving the man a slap. What we didn't realise is that the entrance to the park is not near HQ but back along the road we had driven down. It is possible to transit the park and avoid HQ therefore avoid paying the fee. Without a doubt it is what I would do if I was travelling this way again. It only takes a couple of hours to transit through and unless you are interested in archaeology there is little to see. The petrified forest was interesting though. 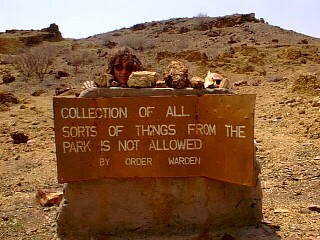 There was no-one around to check the permits and only a sign indicated that we had left the park. The last village in Kenya is Ileret where we were welcomed warmly by the soldiers guarding this border position. We bought beers from them, topped up with water and spent another night next to the lake. This time the wind was not howling as much. In the morning a chap called Patrick said he would accompany us to the border to show us the way. It was an 18 km trip and he was happy to walk back. The route was quite obvious by just following established tracks and the only way we knew we had left Kenya was by the border mark on the GPS. 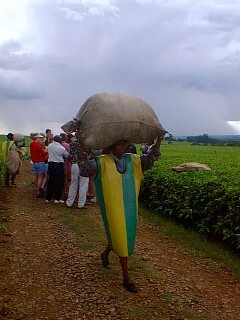 Picking tea in Kericho Transporting the leaves for weighing Tea plantation, Kericho Grades of tea Gordon the master carpenter! Gordie and Jacqui with the winning vehicle The Rhino Charge team Thompson Falls First campfire in ages at Yare Sturdy home!